A 68 year old patient requiring urgent dialysis due to raising potassium was referred to our center. He had 3 indwelling catheters in his heart via right subclavian vein. His left subclavian and interngal jugular veins were thrombosed possibly due to earlier indwelling catheters. The dilemma was if right internal jugular venous route could be used for insertion of dialysis catheter. Under fluoroscopic guidance, right internal jugular vein was cannulated with the dialysis catheter without problems. This case is being presented to highlight the need for imaging both by ultrasound and radiography during the procedure. Introduction: Dexmedetomidine is an alpha-2 agonist used for conscious sedation. It has also been shown to have a myocardial protective effect in off-pump coronary artery bypass patients. The aim of the study was to assess the effect of dexmedetomidine for myocardial protection in percutaneous coronary interventional patients. Methodology: A total of 60 patients (group dexmedetomidine, n = 30 and group normal saline, n = 30) were enrolled in the study. Dexmedetomidine infusion (1 mcg/kg) over 15 min was given as a loading dose after coronary angiography in group dexmedetomidine (D) while normal saline was given in the control group (C) and later maintenance infusion was started at 0.5 mcg/kg/h in both the groups. Coronary vessel diameter was noted before (T0) and after (T1) loading dose of dexmedetomidine/saline in each group. Troponin T (Trop T) values were noted at baseline (T0), 6 h (T2), 12 h (T3) and 24 h (T4) after starting the loading dose. Hemodynamic variables (heart rate [HR] and blood pressure) were monitored at T0, T1, and at regular intervals till 2 h postprocedure. Results: Coronary vessel diameter and HR significantly decreased in group D as compared to control group (P < 0.05) whereas the decrease in Trop T at 6 h, 12 h, and 24 h were not statistically significant between the two groups. Conclusion: Dexmedetomidine decreases the coronary vessel diameter, but maintains the myocardial oxygen demand-supply ratio by decreasing the HR. The decrease in Trop T is statistically insignificant at the doses used. Background: Abdominal complications being rare but results in high mortality, commonly due to splanchnic organ hypoperfusion during the perioperative period of cardiac surgery. There are no feasible methods to monitor intraoperative superior mesenteric artery blood flow (SMABF). 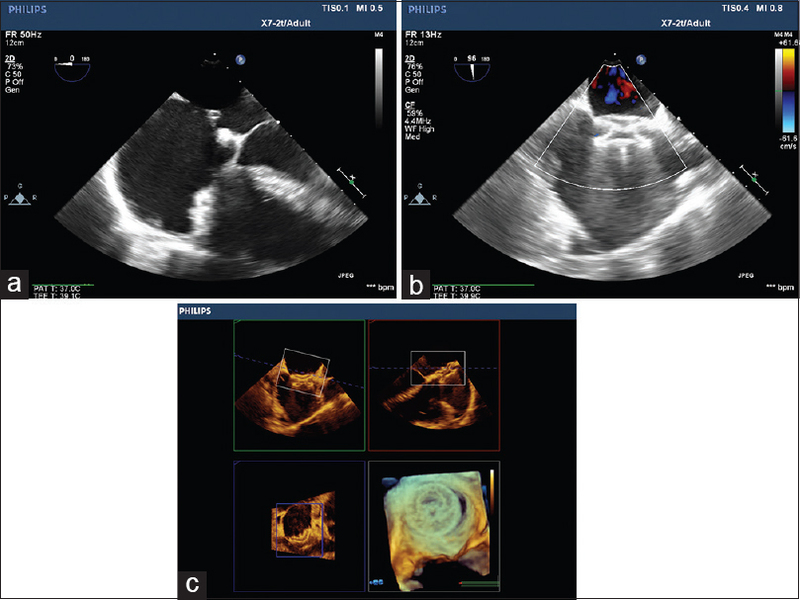 Hence, the aim of this study was to evaluate the feasibility and to measure SMABF using transesophageal echocardiography (TEE) during cardiac surgery under hypothermic cardiopulmonary bypass (CPB). Methodology: Thirty-five patients undergoing elective cardiac surgery under CPB were enrolled. Heart rate, mean arterial pressure (MAP), cardiac output (CO), SMABF, superior mesenteric artery (SMA) diameter, superior mesentric artery blood flow over cardiac output (SMA/CO) ratio and arterial blood lactates were recorded at three time intervals. T0: before sternotomy, T1: 30 min after initiation of CPB and T2: after sternal closure. Results: SMA was demonstrated in 32 patients. SMABF, SMA diameter, SMA/CO, MAP and CO-decreased significantly (P < 0.0001) between T0 and T1, increased significantly ( P ≤ 0.001) between T1 and T2 and no significant change (P > 0.05) between T0 and T2. Lactates increased progressively from T0 to T2. Conclusion: Study shows that there is decrease in SMABF during CPB and returns to baseline after CPB. 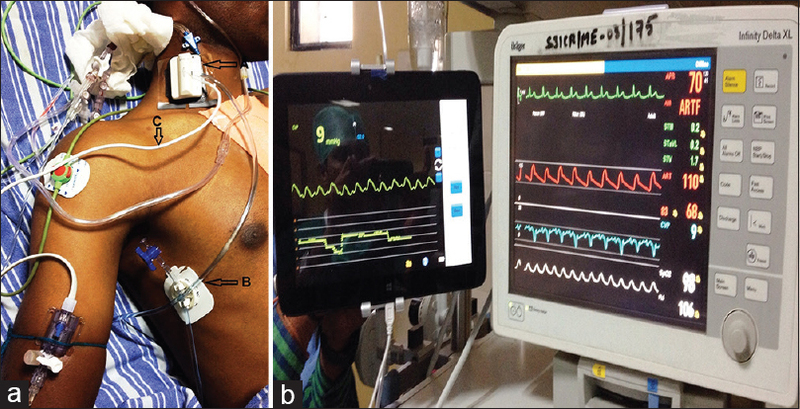 Hence, it is feasible to measure SMABF using TEE in patients undergoing cardiac surgery under hypothermic CPB. TEE can be a promising tool in detecting and preventing splanchnic hypoperfusion during perioperative period. Introduction: Central venous pressure (CVP) measurement is essential in the management of certain clinical situations, including cardiac failure, volume overload and sepsis. 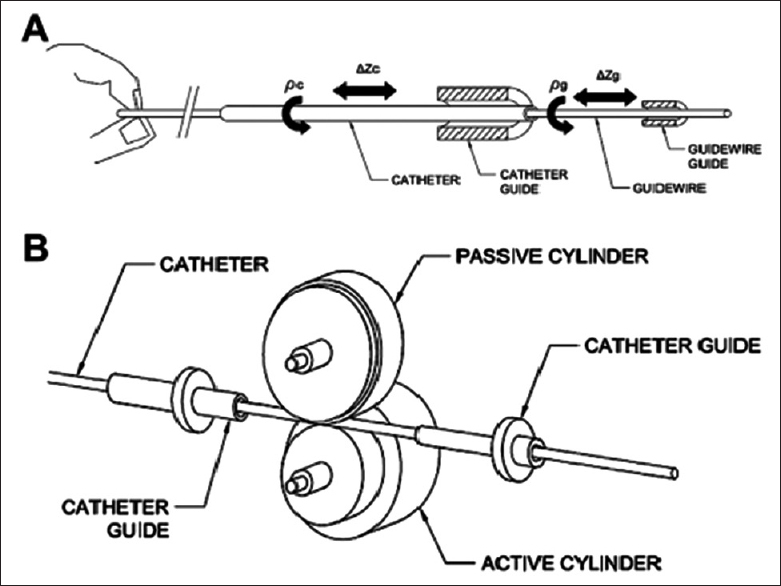 CVP measurement requires catheterization of the central vein which is invasive and may lead to complications. The aim of this study was to evaluate the accuracy of measurement of CVP using a new noninvasive method based on near infrared spectroscopy (NIRS) in a group of cardiac surgical Intensive Care Unit (ICU) patients. Methodology: Thirty patients in cardiac surgical ICU were enrolled in the study who had an in situ central venous catheter (CVC). Sixty measurements were recorded in 1 h for each patient. A total of 1800 values were compared between noninvasive CVP (CVPn) obtained from Mespere VENUS 2000 CVP system and invasive CVP (CVPi) obtained from CVC. Results: Strong positive correlation was found between CVPi and CVPn (R = 0.9272, P < 0.0001). Linear regression equation - CVPi = 0.5404 + 0.8875 × CVPn (r2 = 0.86, P < 0.001), Bland-Altman bias plots showed mean difference ± standard deviation and limits of agreement: −0.31 ± 1.36 and − 2.99 to + 2.37 (CVPi-CVPn). Conclusion: Noninvasive assessment of the CVP based on NIRS yields readings consistently close to those measured invasively. CVPn may be a clinically useful substitute for CVPi measurements with an advantage of being simple and continuous. 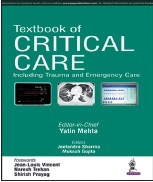 It is a promising tool for early management of acute state wherein knowledge of CVP is helpful. Introduction: Etomidate is usually preferred in the induction of cardiac compromised patients due to its relative cardiovascular stability. However, the use of this drug has been limited as etomidate induces suppression of cortisol biosynthesis as a result of blockade of 11-beta-hydroxylation in the adrenal gland, mediated by the imidazole radical of etomidate. This study was carried out to observe the effect of Vitamin C on adrenal suppression after etomidate induction in patients undergoing cardiac surgery. Materials and Methods: A total of 78 patients were randomly distributed into two groups. Group-I received oral Vitamin C (500 mg) twice daily and Group-II received antacid tablet as placebo twice daily instead of Vitamin C for 7 consecutive days prior to surgery till morning of surgery. Patients of both the groups induced with etomidate (0.1-0.3 mg/kg). 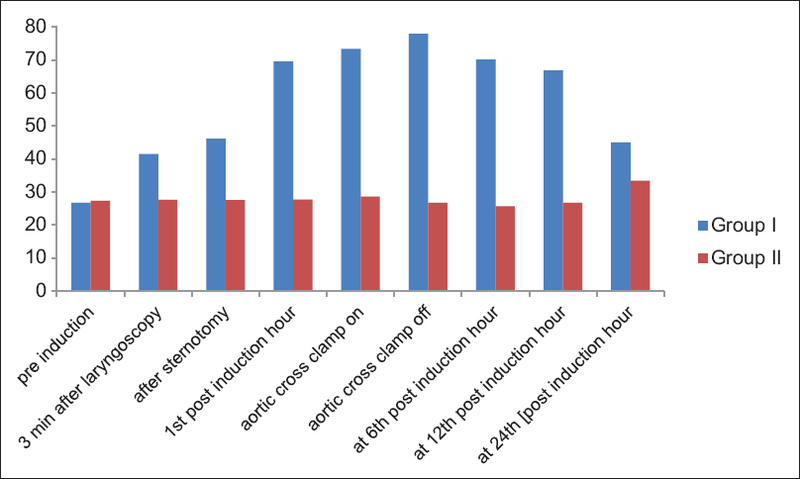 Blood cortisol was estimated at different points of time till 24 th postinduction hour/blood lactate, glucose, hemodynamic parameters, and perioperative outcomes were assessed. Results: Data of seventy patients (n = 35 in each group) were finally analyzed. Cortisol level is statistically significantly higher in Group-I (69.51 ± 7.65) as compared to Group-II (27.74 ± 4.72) (P < 0.05) in the 1 st postinduction hour. In Group-II, cortisol was consistently lower for 1 st 24 postinduction hour. Total adrenaline requirement was statistically significantly high in Group-II. Time of extubation, length of Intensive Care Unit stay arrhythmia was similar in both the groups. Conclusion: Vitamin C effectively inhibits etomidate-induced adrenal suppression in cardiac patients, thereby etomidate can be used as a safe alternative for induction in cardiac surgery under cardiopulmonary bypass when pretreated with Vitamin C.
Background: Cardiac transplantation can be complicated by refractory hemorrhage particularly in cases where explantation of a ventricular assist device is necessary. Recombinant activated factor VII (rFVIIa) has been used to treat refractory bleeding in cardiac surgery patients, but little information is available on its efficacy or cost in heart transplant patients. Methods: Patients who had orthotopic heart transplantation between January 2009 and December 2014 at a single center were reviewed. Postoperative bleeding and the total costs of hemostatic therapies were compared between patients who received rFVIIa and those who did not. Propensity scores were created and used to control for the likelihood of receiving rFVIIa in order to reduce bias in our risk estimates. Results: Seventy-six patients underwent heart transplantation during the study period. Twenty-one patients (27.6%) received rFVIIa for refractory intraoperative bleeding. There was no difference in postoperative red blood cell transfusion, chest tube output, or surgical re-exploration between patients who received rFVIIa and those who did not, even after adjusting with the propensity score (P = 0.94, P = 0.60, and P = 0.10, respectively). The total cost for hemostatic therapies was significantly higher in the rFVIIa group (median $10,819 vs. $1,985; P < 0.0001). Subgroup analysis of patients who underwent redo-sternotomy with left ventricular assist device explantation did not show any benefit for rFVIIa either. Conclusions: In this relatively small cohort, rFVIIa use was not associated with decreased postoperative bleeding in patients undergoing heart transplantation; however, it led to significantly higher cost. Background: Active mobilization is a key component in fast-track surgical strategies. Following major surgery, clinicians are often reluctant to mobilize patients arguing that circulatory homeostasis would be impaired as a result of myocardial stunning, fluid shift, and autonomic dysfunction. Aims: We examined the feasibility and safety of a mobilization protocol 12-24 h after elective cardiac surgery. Setting and Design: This observational study was performed in a tertiary nonacademic cardiovascular Intensive Care Unit. Materials and Methods: Over a 6-month period, we prospectively evaluated the hemodynamic response to a two-staged mobilization procedure in 53 consecutive patients. Before, during, and after the mobilization, hemodynamics parameters were recorded, including the central venous oxygen saturation (ScvO 2 ), lactate concentrations, mean arterial pressure (MAP), heart rate (HR), right atrial pressure (RAP), and arterial oxygen saturation (SpO 2 ). Any adverse events were documented. Results: All patients successfully completed the mobilization procedure. Compared with the supine position, mobilization induced significant increases in arterial lactate (34.6% [31.6%, 47.6%], P = 0.0022) along with reduction in RAP (−33% [−21%, −45%], P < 0.0001) and ScvO 2 (−7.4% [−5.9%, −9.9%], P = 0.0002), whereas HR and SpO 2 were unchanged. Eighteen patients (34%) presented a decrease in MAP > 10% and nine of them (17%) required treatment. Hypotensive patients experienced a greater decrease in ScvO 2 (−18 ± 5% vs. −9 ± 4%, P = 0.004) with similar changes in RAP and HR. 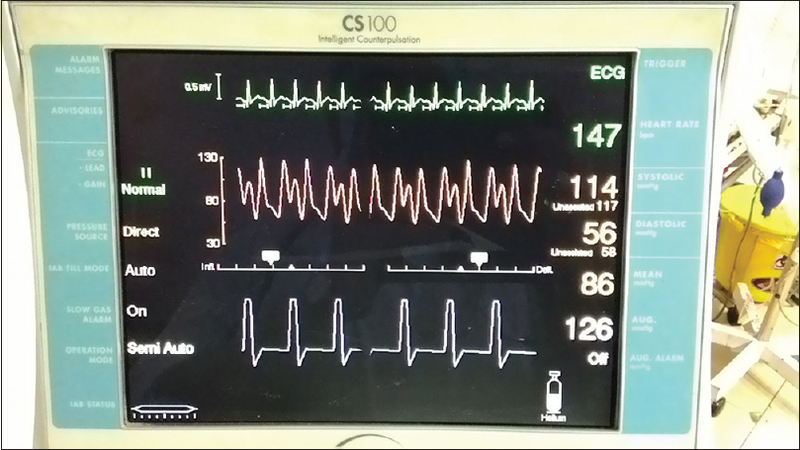 All hemodynamic parameters, but arterial lactate, recovered baseline values after resuming the horizontal position. 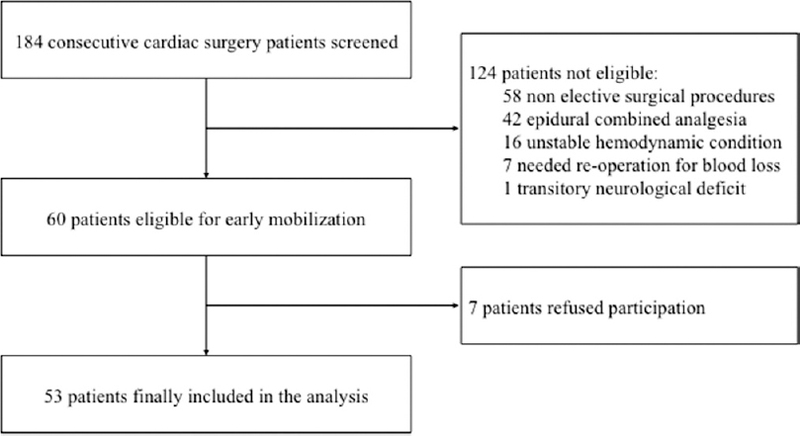 Conclusions: Early mobilization after cardiac surgery appears to be a safe procedure as far as it is performed under close hemodynamic and clinical monitoring in an intensive care setting. Background: Minimal invasive surgeries are carried out to benefit the patient with less pain, blood loss, mechanical ventilation and hospital stay; a smaller scar is not the aim. Minimal invasive cardiac surgeries are carried out via small sternotomy, small thoracotomy and via robotic arms. Subxiphoid route is a novel method and avoids sternotomy. Aim: This case series is an attempt to understand the anesthetic modifications required. Secondly, whether it is feasible to carry out subxiphoid coronary artery bypass surgery. Methods: Elective patients scheduled to undergo subxiphoid coronary artery bypass surgery were chosen. The surgeries were conducted under general anesthesia with left lung isolation via either endobronchial tube or bronchial blocker. Results: We conducted ten (seven males and 3 females) coronary artery bypass graft surgeries via subxiphoid technique. The mean EuroSCORE was 1.7 and the mean ejection fraction was 53.6. Eight patients underwent surgery via endobronchial tube, while, in the remaining two lung isolation was obtained using bronchial blocker. Mean blood loss intraoperatively was 300 ± 42 ml and postoperatively 2000 ± 95 ml. The pain score on the postoperative day '0' was 4.3 ± 0.6 and 2.3 ± 0.7 on the day of discharge. Length of stay in the hospital was 4.8 ± 0.9 days. There were no complications, blood transfusions, conversion to cardiopulmonary bypass. 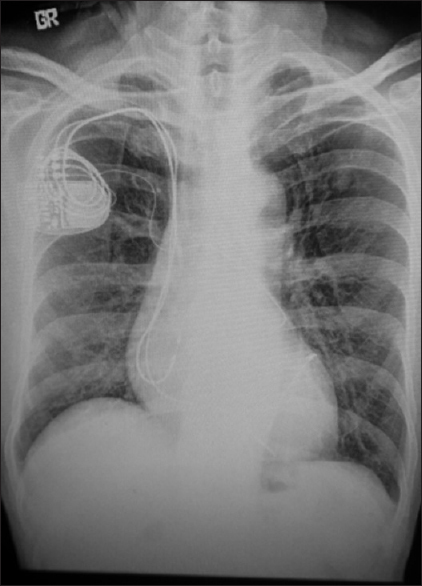 The modifications in the anesthetic and surgical techniques are, use of left lung isolation using either endobronchial tube or bronchial blocker, increased duration for conduit harvesting, grafting, requirement of transesophageal echocardiography monitoring in addition to hemodynamic monitoring. Other minor requirements are transcutaneous pacing and defibrillator pads, a wedge under the chest to 'lift' up the chest, sparing right femoral artery and vein (to serve as vascular access) for an unlikely event of conversion to cardiopulmonary bypass. Any anesthesiologist wishing to start this technique must be aware of these modifications. Conclusions: Subxiphoid route is safe to carry out coronary artery bypass graft surgery using the minimal invasive cardiac surgery. It is reproducible and has undeniable benefits. We plan to conduct such surgeries in awake patients under thoracic epidural anesthesia thus making it even less invasive and amenable for fast tracking. Objectives: To investigate the release pattern of different cardiac metabolites and biomarkers directly from the coronary sinus (CS) and to establish the diagnostic discrimination limits of each marker protein and metabolites to evaluate perioperative myocardial injury in patients undergoing cardiac surgery under cardiopulmonary bypass (CPB). Patients and Methods: Sixty-eight patients undergoing first mitral and/or aortic valve replacements with/without coronary artery bypass grafting and Bentall procedure under CPB and blood cardioplegic arrest were studied. All cardiac metabolites and biomarkers were measured in serial CS-derived blood samples at pre-CPB, immediate post aortic declamping, 10 minutes post-CPB and 12 hrs post-CPB. Results: Receiver operating characteristic curve analysis of cardiac biomarkers indicated lactate-pyruvate ratio as the superior diagnostic discriminator of myocardial injury with an optimal "cut-off" value >10.8 immediately after aortic declamping (AUC, 0.92; 95% CI: 0.85-0.98). Lactate was the second best diagnostic discriminator of myocardial injury with an optimal "cut-off" value >2mmol/l at immediately after aortic declamping (AUC, 0.89; 95% CI: 0.80-0.96). Cardiac troponin-I was the third best diagnostic discriminator of myocardial injury with an optimal "cut-off" value >2.1ng/ml at immediately after aortic declamping (AUC, 0.88; 95% CI: 0.80-0.95). Creatine kinase-MB was the fourth best diagnostic discriminator of myocardial injury with an optimal "cut-off" value >58 log units/ml prior to decanulation (AUC, 0.85; 95% CI: 0.78-0.94). Conclusions: Measurable cardiac damage exists in all patients undergoing cardiac surgery under cardioplegic arrest. The degree of myocardial injury is more in patients with poor ventricular function and those requiring longer aortic clamp time. CS-derived lactate-pyruvate ratio, lactate, cTn-I served as superior diagnostic discriminators of peri-operative myocardial damage. Objective: Metabolic acidosis after deep hypothermic circulatory arrest (DHCA) for thoracic aortic operations is commonly managed with sodium bicarbonate (NaHCO 3 ). The purpose of this study was to determine the relationships between total NaHCO 3 dose and the severity of metabolic acidosis, duration of mechanical ventilation, duration of vasoactive infusions, and Intensive Care Unit (ICU) or hospital length of stay (LOS). Methods: In a single center, retrospective study, 87 consecutive elective thoracic aortic operations utilizing DHCA, were studied. Linear regression analysis was used to test for the relationships between the total NaHCO 3 dose administered through postoperative day 2, clinical variables, arterial blood gas values, and short-term clinical outcomes. Results: Seventy-five patients (86%) received NaHCO 3 . 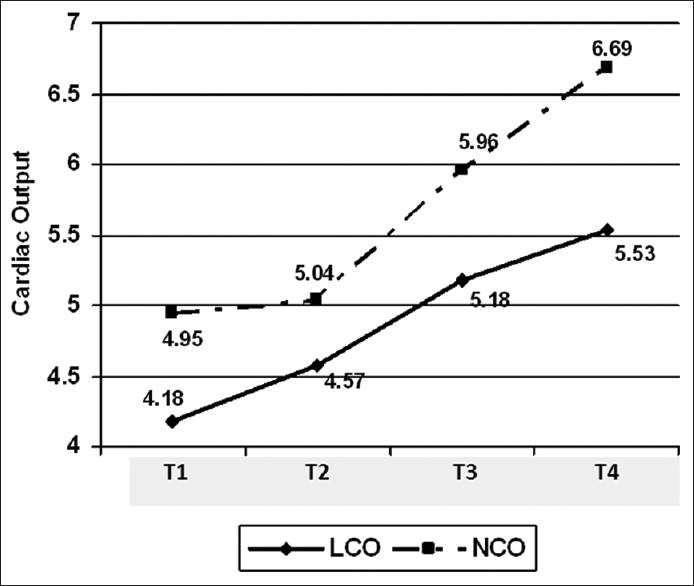 Total NaHCO 3 dose averaged 136 ± 112 mEq (range: 0.0-535 mEq) per patient. 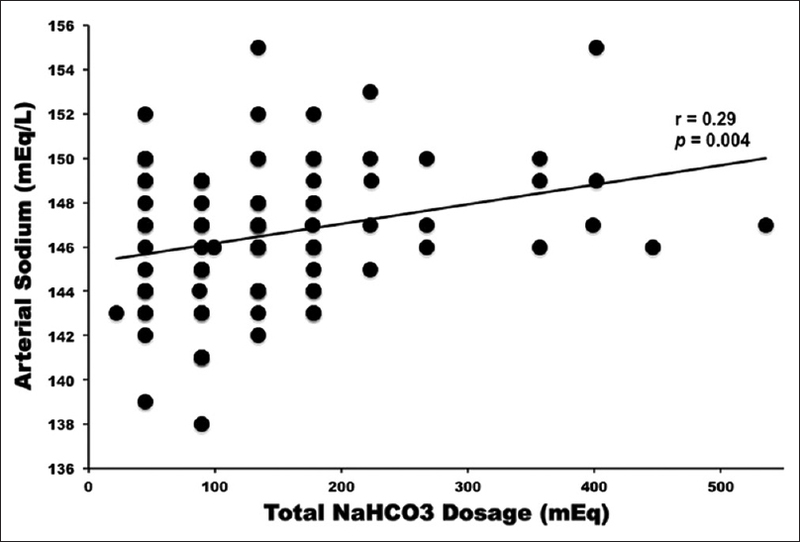 Total NaHCO 3 dose correlated with minimum pH (r = 0.41, P < 0.0001), minimum serum bicarbonate (r = −0.40, P < 0.001), maximum serum lactate (r = 0.46, P = 0.007), duration of metabolic acidosis (r = 0.33, P = 0.002), and maximum serum sodium concentrations (r = 0.29, P = 0.007). Postoperative hypernatremia was present in 67% of patients and peaked at 12 h following DHCA. Eight percent of patients had a serum sodium ≥ 150 mEq/L. Total NaHCO 3 dose did not correlate with anion gap, serum chloride, not the duration of mechanical ventilator support, vasoactive infusions, ICU or hospital LOS. Conclusion: Routine administration of NaHCO 3 was common for the management of metabolic acidosis after DHCA. Total dose of NaHCO 3 was a function of the severity and duration of metabolic acidosis. NaHCO 3 administration contributed to postoperative hypernatremia that was often severe. The total NaHCO 3 dose administered was unrelated to short-term clinical outcomes. Objective: The aim of this study is to determine safety and feasibility of conscious sedation using dexmedetomidine for transcatheter atrial septal defect (ASD) device closure. Material and Methods: A retrospective institutional review of transcatheter ASD device closure without endotracheal intubation over 18 months. The protocol included topical oropharyngeal anesthesia using lignocaine followed by dexmedetomidine bolus 1 μg/kg intravenously over 10 min and maintenance dose 0.2-0.7 μg/kg/h. Ramsay sedation score 2-3 was maintained. Patients were analyzed regarding demographic profile, device size, procedure time, anesthesia time, recovery time, hospital stay, and any hemodynamic or procedural complications. Results: A total of 43 patients with mean age 31.56 ± 13.74 years (range: 12-56 years) were analyzed. Mean anesthesia duration was 71.75 + 21.08 min. Mean recovery time was 7.6 ± 3.01 min. 16 females and one male patient required additional propofol with a mean dose of 30.8 ± 10.49 mg. No hemodynamic instability was noted. No patient required general anesthesia with endotracheal intubation. The procedure was successful in 93.02% of patients. Four patients developed atrial fibrillation. All patients were satisfied. Conclusion: Conscious sedation using dexmedetomidine is a safe and effective anesthetic technique for percutaneous ASD closure. Background: Conduct of stable inhalational anesthetic induction in children with congenital heart disease (CHD) presents special challenges. It requires in-depth understanding of the effect of congenital shunt lesions on the uptake, delivery, and equilibration of anesthetic drugs. Intracardiac shunts can alter the induction time and if delivery of anesthetic agent is not carefully titrated, can lead to overdosing and undesirable myocardial depression. Aims: To study the effect of congenital shunt lesions on the speed of inhalational induction and also the impact of inhalational induction on hemodynamics in the presence of congenital shunt lesions. Setting: Tertiary care hospital. Design: A prospective, single-center clinical study. Materials and Methods: Ninety-three pediatric patients undergoing elective surgery were segregated into three equal groups, namely, Group 1: no CHD, Group 2: acyanotic CHD, and Group 3: cyanotic CHD. General anesthesia was induced with 8% sevoflurane in 6 L/min air-oxygen. The time to induction was noted at loss of eyelash reflex and decrease in bispectral index (BIS) value below 60. End-tidal sevoflurane concentration, minimum alveolar concentration, and BIS were recorded at 15 s intervals for the 1 st min followed by 30 s interval for another 1 min during induction. Hemodynamic data were recorded before and after induction. 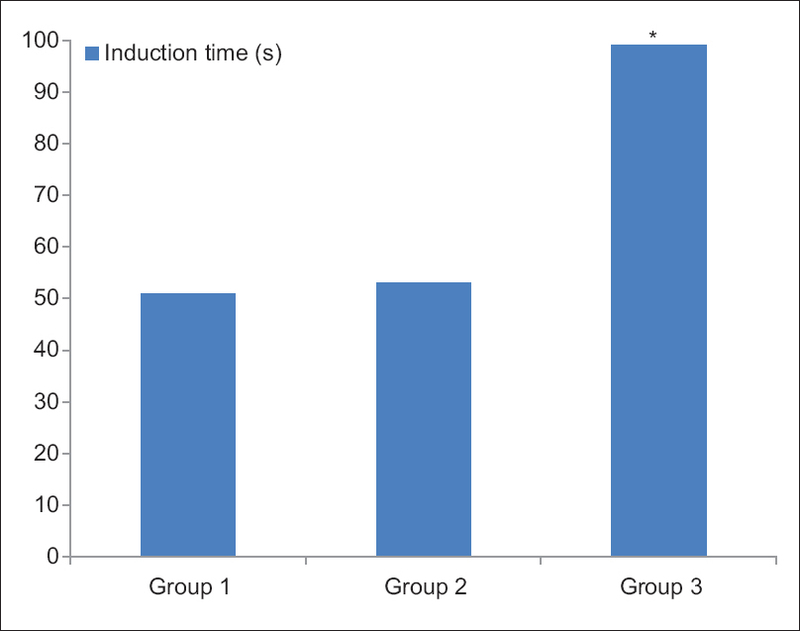 Results: Patients in Group 3 had significantly prolonged induction time (99 ± 12.3 s; P < 0.001), almost twice that of the patients in other two groups (51 ± 11.3 s in Group 1 and 53 ± 12.0 s in Group 2). Hypotension occurred after induction in Group 1. No other adverse hemodynamic perturbations were observed. Conclusion: The time to inhalational induction of anesthesia is significantly prolonged in patients with right-to-left shunt, compared to patients without CHD or those with left-to-right shunt, in whom it is similar. Sevoflurane is safe and maintains stable hemodynamics in the presence of CHD. Context: One of the main limitations of off-pump coronary artery bypass grafting (OPCAB) is the occasional need for intraoperative conversion (IOC) to on-pump coronary artery bypass grafting. IOC is associated with a significantly increased risk of mortality and postoperative morbidity. The impact of IOC on outcome cannot be assessed by a randomized control design. Aims: The objective of this study was to analyze the incidence, risk factors, and impact of IOC on the outcome in patients undergoing OPCAB. Settings and Design: Three tertiary care level hospitals; retrospective observational study. Subjects and Methods: This retrospective observational study included 1971 consecutive patients undergoing OPCAB from January 2012 to October 2015 at three tertiary care level hospitals by four surgeons. The incidence, patient characteristics, cause of IOC, and its impact on outcome were studied. Statistical Analysis Used: The cohort was divided into two groups according to IOC. Univariate logistic regression was performed to describe the predictors of IOC. Variables that were found to be significant in univariate analysis were introduced into multivariate model, and adjusted odds ratio (OR) was calculated. To further assess the independent effect of IOC on mortality, propensity score matching with a 5:1 ratio of non-IOC to IOC was performed. Results: The overall all-cause in-hospital mortality was 2.6%. IOC was needed in 128 (6.49%) patients. The mortality in the IOC group was significantly higher than non-IOC group (21 of 128 [16.4%] vs. 31 of 1843 [1.7%], P = 0.0001). The most common cause for IOC was hemodynamic disturbances during grafting to the obtuse marginal artery (51/128; 40%). On multivariate logistic regression analysis, left main disease, pulmonary hypertension, and mitral regurgitation independently predicted IOC. We obtained a propensity-matched sample of 692 patients (No IOC 570; IOC 122), and IOC had OR of 16.26 (confidence interval 6.3-41; P < 0.0001) for mortality in matched population. Conclusions: Emergency IOC increases odds for mortality by 16-fold. Hence, identification of patients at higher risk of IOC may improve the outcome. Coronary artery bypass grafting surgery effectively relieves signs and symptoms of myocardial ischemia. The left internal thoracic artery (LITA) graft is the gold standard having 90-95% patency rate at 10 years, whereas only 50% of saphenous vein (SV) grafts are patent at 10 years. However, there is a novel "no touch" technique in order to harvest an SV complete with its cushion of surrounding tissue, thus maintaining its endothelium-intact. Significantly superior short- and long-term graft patency rates comparable to LITA grafts can be achieved. Consequently, the SV may be revived as an important conduit in coronary artery bypass surgery. Continuously growing patient's demand, technological innovation, and surgical expertise have led to the widespread popularity of minimally invasive cardiac surgery (MICS). Patient's demand is being driven by less surgical trauma, reduced scarring, lesser pain, substantially lesser duration of hospital stay, and early return to normal activity. In addition, MICS decreases the incidence of postoperative respiratory dysfunction, chronic pain, chest instability, deep sternal wound infection, bleeding, and atrial fibrillation. Widespread media coverage, competition among surgeons and hospitals, and their associated brand values have further contributed in raising awareness among patients. In this process, surgeons and anesthesiologist have moved from the comfort of traditional wide incision surgeries to more challenging and intensively skilled MICS. A wide variety of cardiac lesions, techniques, and approaches coupled with a significant learning curve have made the anesthesiologist's job a challenging one. Anesthesiologists facilitate in providing optimal surgical settings beginning with lung isolation, confirmation of diagnosis, cannula placement, and cardioplegia delivery. However, the concern remains and it mainly relates to patient safety, prolonged intraoperative duration, and reduced surgical exposure leading to suboptimal treatment. The risk of neurological complications, aortic injury, phrenic nerve palsy, and peripheral vascular thromboembolism can be reduced by proper preoperative evaluation and patient selection. Nevertheless, advancement in surgical instruments, perfusion practices, increasing use of transesophageal echocardiography, and accumulating experience of surgeons and anesthesiologist have somewhat helped in amelioration of these valid concerns. A patient-centric approach and clear communication between the surgeon, anesthesiologist, and perfusionist are vital for the success of MICS. 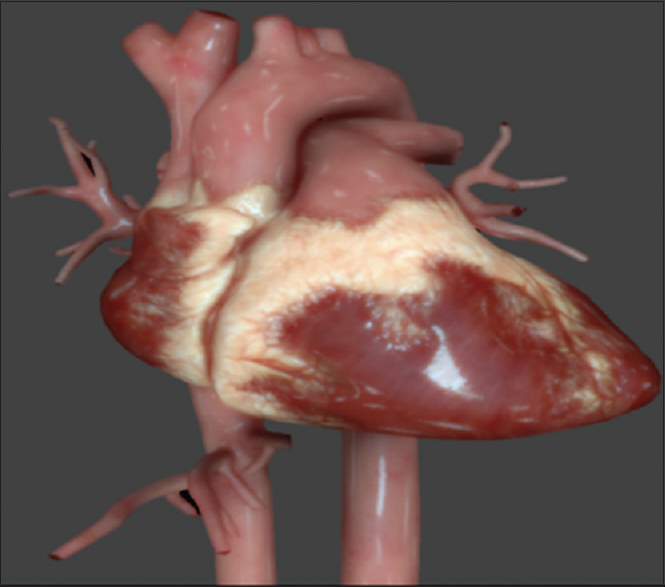 Simulation allows interactive transthoracic echocardiography (TTE) learning using a virtual three-dimensional model of the heart and may aid in the acquisition of the cognitive and technical skills needed to perform TTE. The ability to link probe manipulation, cardiac anatomy, and echocardiographic images using a simulator has been shown to be an effective model for training anesthesiology residents in transesophageal echocardiography. 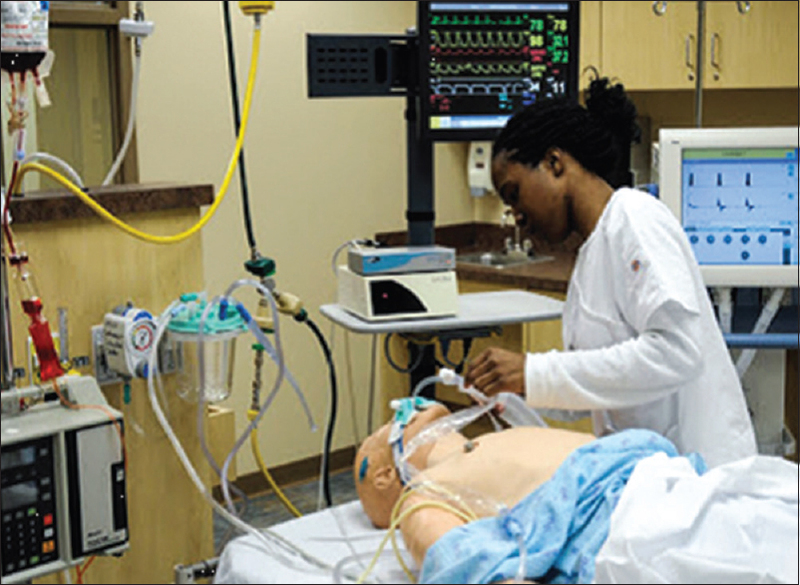 A proposed alternative to real-time reality patient-based learning is simulation-based training that allows anesthesiologists to learn complex concepts and procedures, especially for specific structures such as aortic valve. Pediatrics is a challenging field where "Time is Essence" and the interplay of time-bound dynamics has a huge influence on the outcomes, particularly in an acutely ill child. 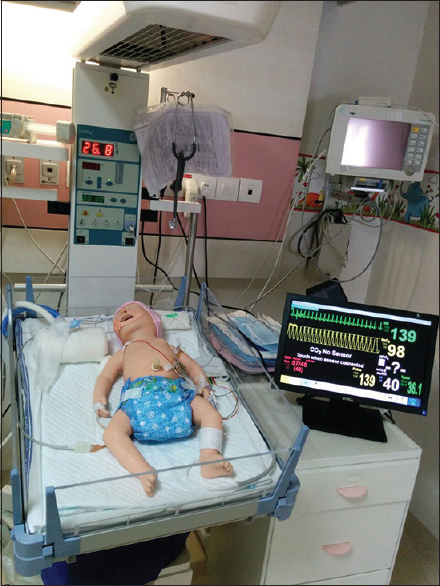 In this context, simulation based training appears to play a major role in training young Paediatricians to develop critical decision making skills and learning in a risk-free environment. 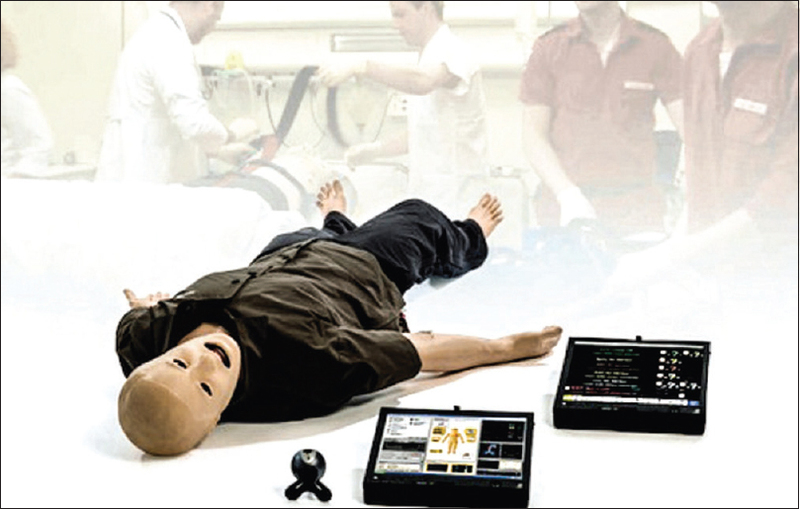 In present times and in future, it is expected that simulation is used by practically every healthcare provider at some or multiple points in the training and certification process. 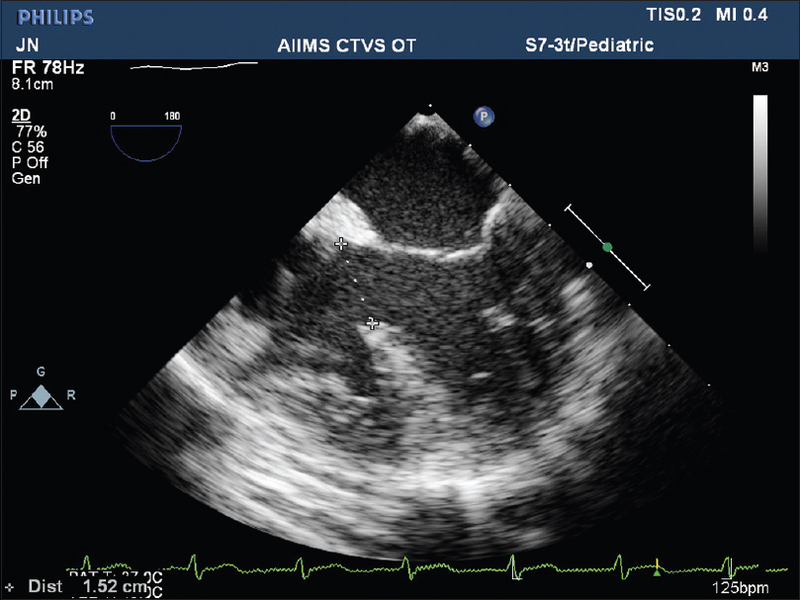 With the growing requirement of echocardiography in the perioperative management, the anesthesiologists need to be well trained in transthoracic echocardiography (TTE). Lack of formal, structured teaching program precludes the same. The present article reviews the expanding domain of TTE, simulation-based TTE training, the advancements, current limitations, and the importance of simulation-based training for the anesthesiologists. Computer simulations can come in handy to train medical personnel with necessary skills to face the clinical scenarios involving various coagulopathies. Now a days, point of care (POC) devices such as thromboelastography, Sonoclot analyzer and newly approved rotational thromboelastometry (ROTEM) with faster results to assess coagulopathies are available on bedside of patients. 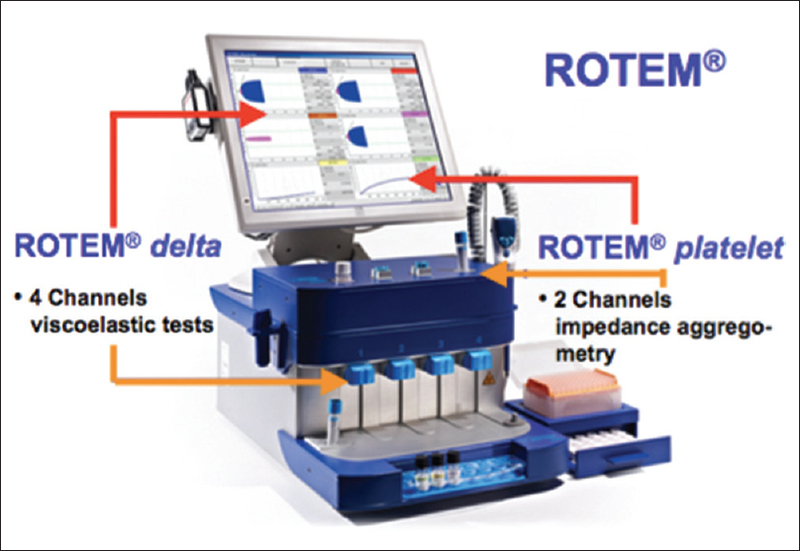 ROTEM is emerging as a quick, portable, and well-validated device to evaluate coagulopathy in critical care and perioperative setup. A novel platelet-aggregometry integrated module enables simultaneous analysis of platelets as well as coagulation tests on the same screen. The entire gamut of POC signature curves obtained with different coagulation defects can be learned with graphical simulations. These simulations can be a valuable strategy to elucidate latent conditions, for which simulation interventions can then be designed to mimic different clinical scenarios. Simulation is an effective teaching tool to decrease the learning curve for novices without compromising patient safety. Simulation helps interventionalist in mentally translating a two dimentional, black and white image into a usable three dimentional model. It also bridges the gap in training diverse team members on new procedures and products. All simulators have collision detection, i.e., virtual contact forces generated from collision which updates haptic output with new calculations. Minimally invasive cardiac surgery/coronary artery bypass grafting (MICS CABG) is performed through a small 2 inch left thoracotomy incision. Lung isolation is must during MICS CABG. 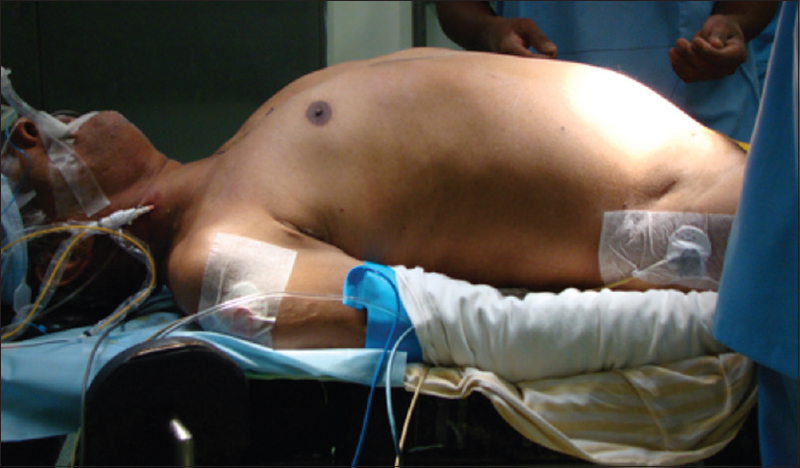 Oxygenation with one-lung ventilation can be difficult, especially during supine position. 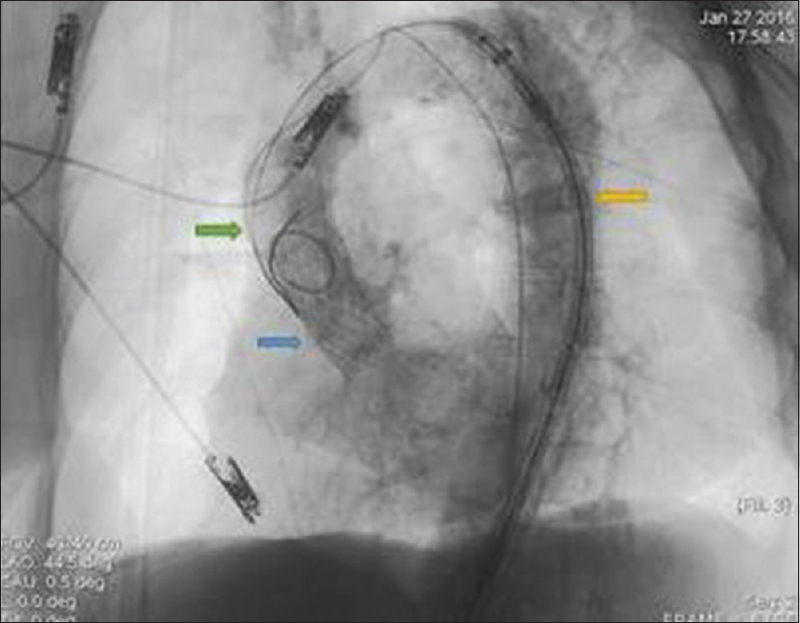 We report a case of a 53-year-old male patient who underwent MICS CABG with the selective lobar blockade. 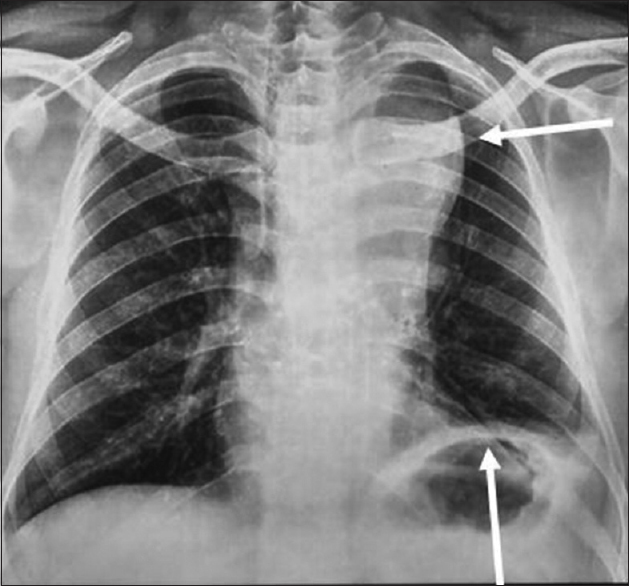 Although insertion of chest drain tubes is a common medical practice, there are risks associated with this procedure, especially when inexperienced physicians perform it. Wrong insertion of the tube has been known to cause morbidity and occasional mortality. We report a case where the left ventricle was accidentally punctured leading to near-exsanguination. This report is to highlight the need for experienced physicians to supervise the procedure and train the younger physician in the safe performance of the procedure. 60 years old lady presented with chest pain and was admitted in local hospital. Electrocardiogram was suggestive of anterior myocardial ischemia. Patient underwent coronary angiography which revealed severe triple vessles coronary artery disease. As patient was hemodynamically unstable and in cardiogenic shock, intraaortic balloon pump was inserted .IABP augmented diastolic blood pressure was less than unassisted systolic blood pressure despite setting maximum augmentation on IABP machine. Infective endocarditis is a rare occurrence in the main pulmonary artery trunk and even rarer in tetralogy of Fallot. Transcatheter aortic valve implantation (TAVI) is without any doubt a standard technique and the treatment of choice of severe aortic valve stenosis (AVS) in very high-operative risk patients. However, a number of complications may occur and has been described. 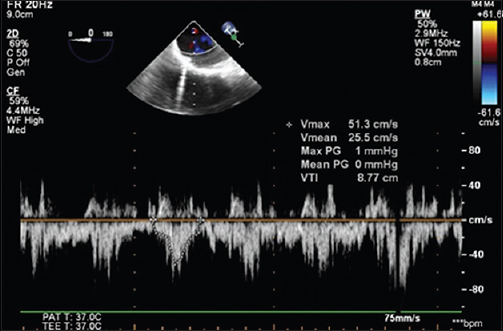 Improper valve position, valve migration, paravalvular regurgitation, conduction disturbances, stroke and aortic dissection have been succeeded despite the perfection of the technique. For anyone of the complications above described, a solution may be invented. 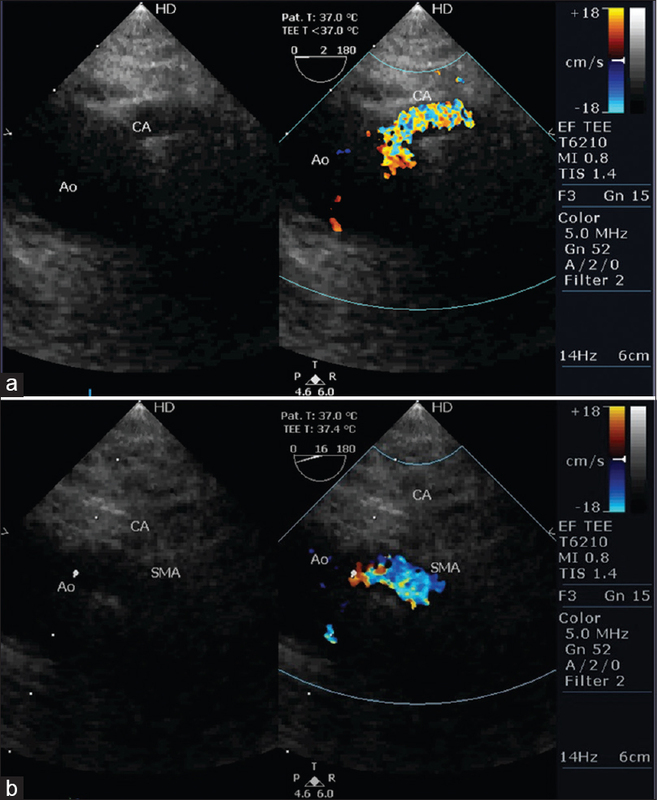 We present an interesting case of an 81-year-old woman with severe AVS treated through TAVI due to very high operative risk. 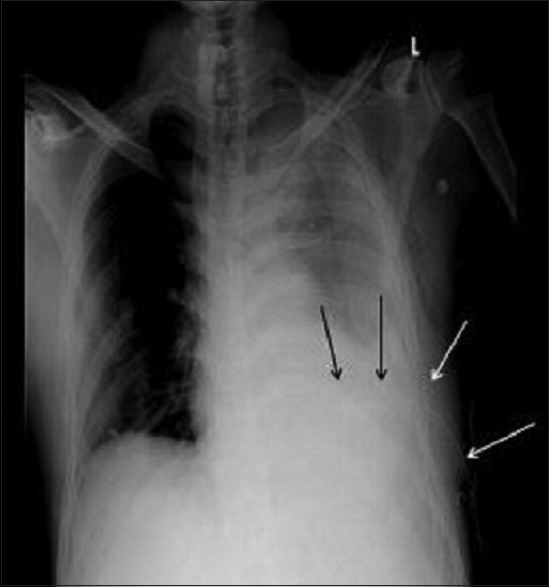 This female, 12 days later presented with thoracic pain and shortness of breath and through the computed tomography of the chest performed was diagnosed a dissection of the descending aorta. She successfully underwent on thoracic endovascular aortic repair. In this report, we refer the bibliographic data and we discuss the treatment options in these cases. Savlon (0.5% cetrimide/0.05% chlorhexidine) is used as a scolicidal during surgery of hydatid cysts. It is considered a safe and effective agent. However, there are no recommendations for the appropriate concentration or dosage of these agents. Previously reported to cause severe metabolic acidosis, its effects on the pulmonary system have not been explored. 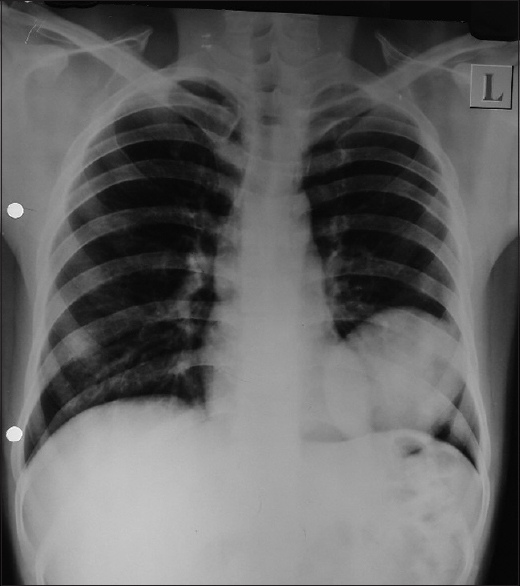 We present a case of acute lung injury and respiratory distress along with acute cardiopulmonary distress, severe metabolic acidosis, and renal failure following its use during surgical removal of pulmonary hydatid cyst. The agent may act as a chemical sclerosant causing pulmonary parenchymal damage through bronchial openings present in the pericyst. Till safe dose limits are known, use of this agent should be limited, especially in large or multiple cyst surgery. We report a rare complication of massive aneurysm of the proximal ligated end of the main pulmonary artery which occurred in the setting of a patient with a functionally univentricular heart and increased pulmonary blood flow undergoing superior cavopulmonary connection. Awareness of this possibility may guide others to electively transect the pulmonary artery in such a clinical setting. Airway compression due to distal aortic arch and descending aortic aneurysm repair has been documented. 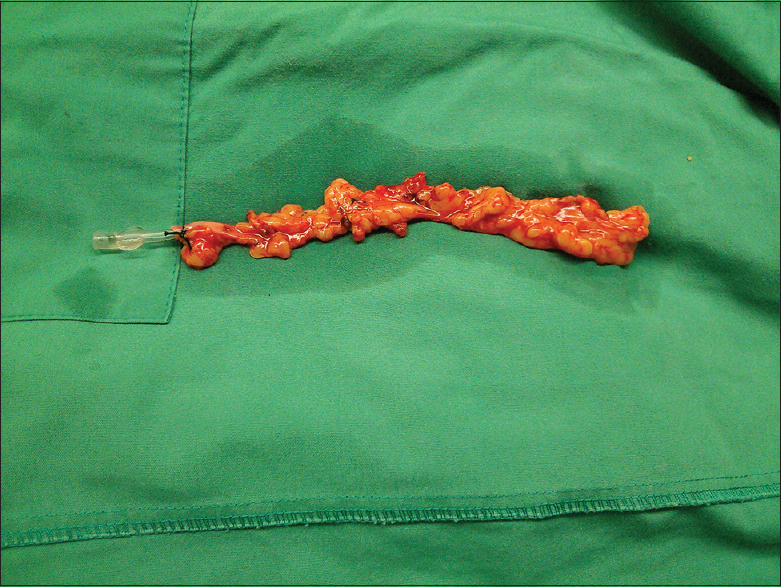 This case of tracheal and left main stem bronchus compression due to aortic aneurysm occurred in a 42-year-old man. The airway compression poses a challenge for the anesthesiologist in airway management during aortic aneurysm repair surgery. 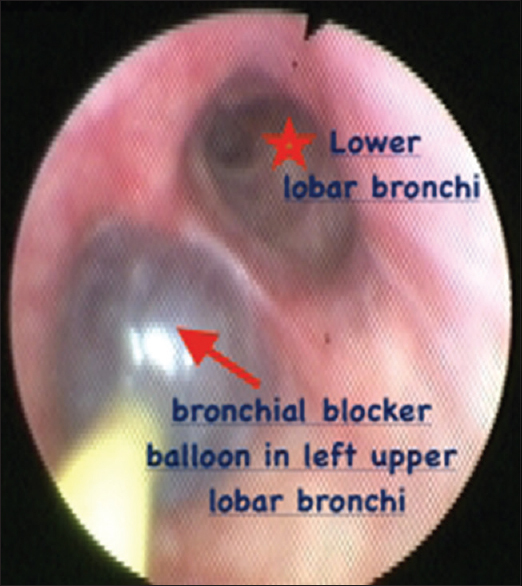 The fiber-optic bronchoscope is very helpful in decision-making both preoperatively and postoperatively in such cases. 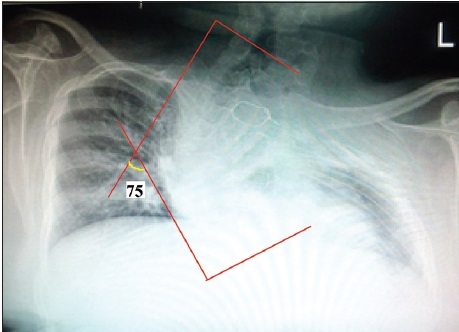 We report a case of airway compression in a 42-year-old patient who underwent elective distal aortic arch and descending aortic aneurysm repair.